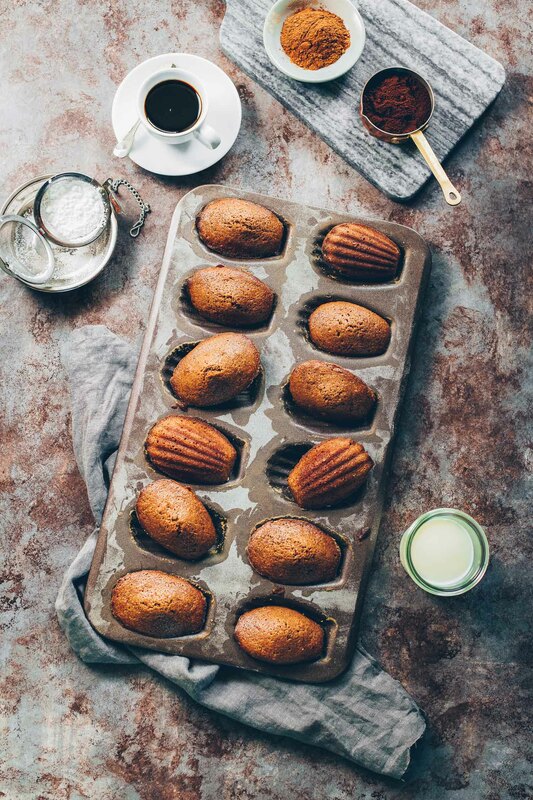 Madeleines are the perfect little cakes to satisfy a sweet craving. These have a lovely vanilla flavor with subtle coffee and chocolate notes. I share my baking tips to get the signature humps. My husband and I opted for a tropical Thanksgiving this year. Instead of turkey, all the fixings and quelling the fall chill in front of a cozy fire we’re back to eating lighter fare and sitting under an umbrella at the beach. As the holiday came and went, it surprised me to realize that I missed not having a proper Thanksgiving meal and that for the first time in almost twenty years I didn’t have turkey leftovers to repurpose. 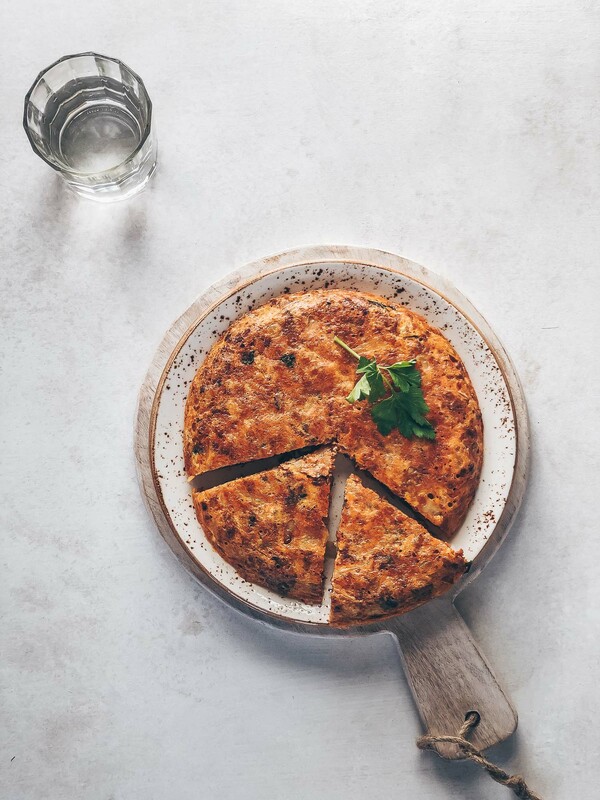 Most of all, I missed the pies–apple, pumpkin, pecan–I love them all. I have access to a kitchen when in Maui but the oven is the last thing I want to use when it’s hot and humid. The craving is so strong I might just run straight to the kitchen to bake a pie when we return home. Until then the memory of my most recent baking project will have to tide me over. 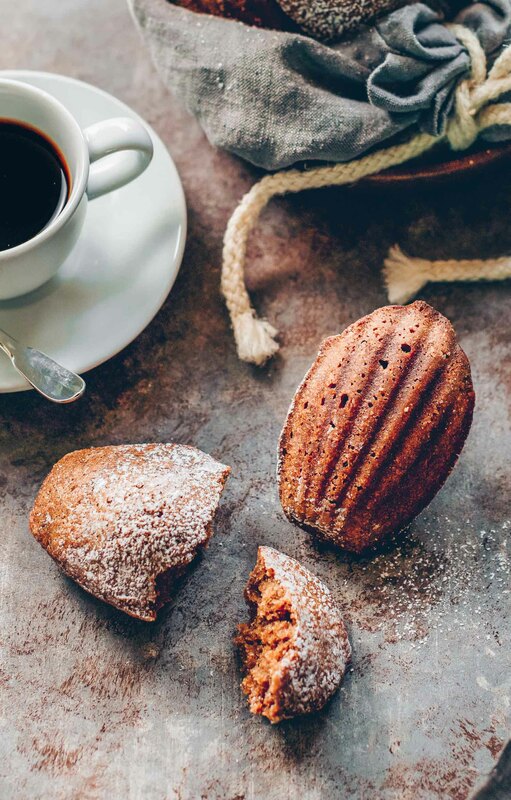 Madeleines are the perfect little treats to satisfy a sweet craving–neither too big nor too small and adaptable to countless flavor combinations. These shell-shaped cakes have a lovely vanilla flavor with subtle coffee and chocolate notes. 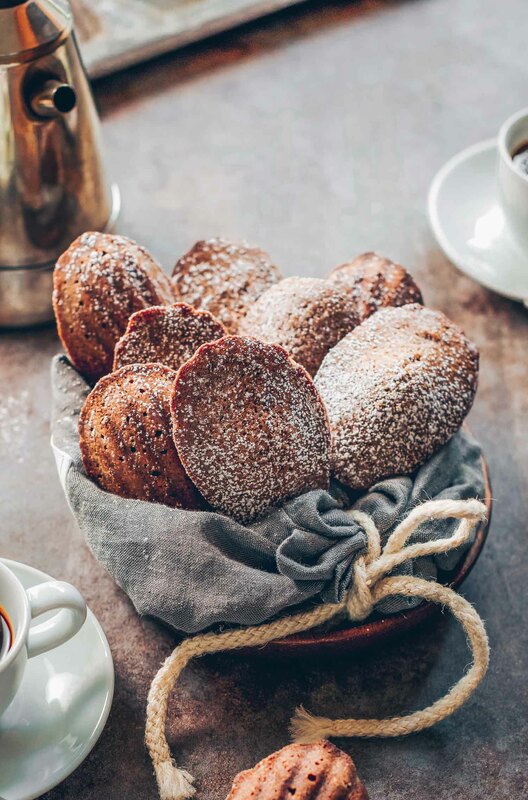 They’re nicely brown at the bottom, firm with a spongy texture, crisp around the edges right out of the oven and have the signature humps–all characteristics of the perfect madeleine. If you’ve baked madeleines before you will agree that the benchmark for success are the humps protruding from the belly of the little cakes. 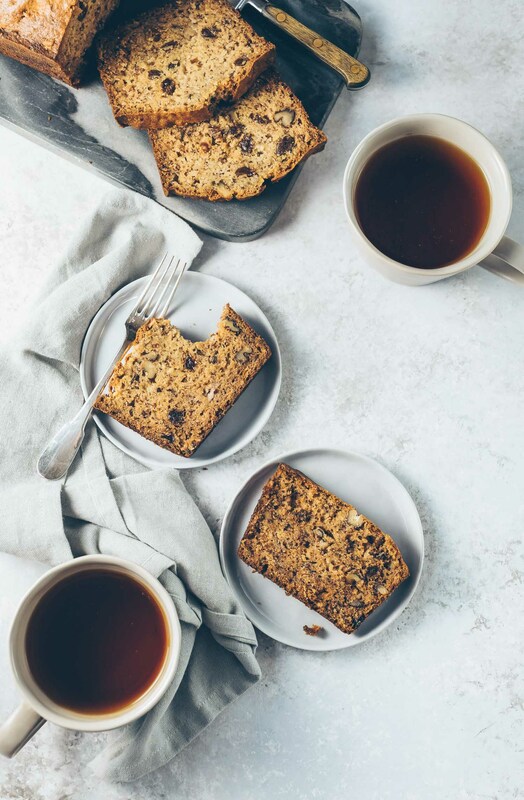 It doesn’t matter if you’ve created the most amazing flavor combination–without the humps they will taste great but you won’t be perfectly happy (your family and friends will love them anyway). Be Gentle with the Batter: Gently folding the dry ingredients into the wet ingredients will keep you from getting dense madeleines. Do not overmix. 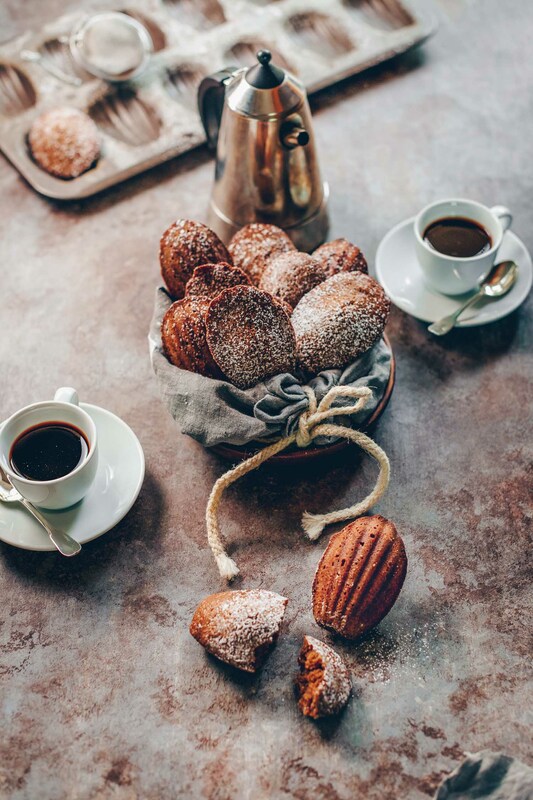 Rest the Batter: As tempting as it is to bake your madeleines right away, if you want to be able to boast about the signature humps the batter will need to rest in the refrigerator for a minimum of three hours, preferably overnight. This allows for time to hydrate the flour (also creating a thicker batter) without overmixing. 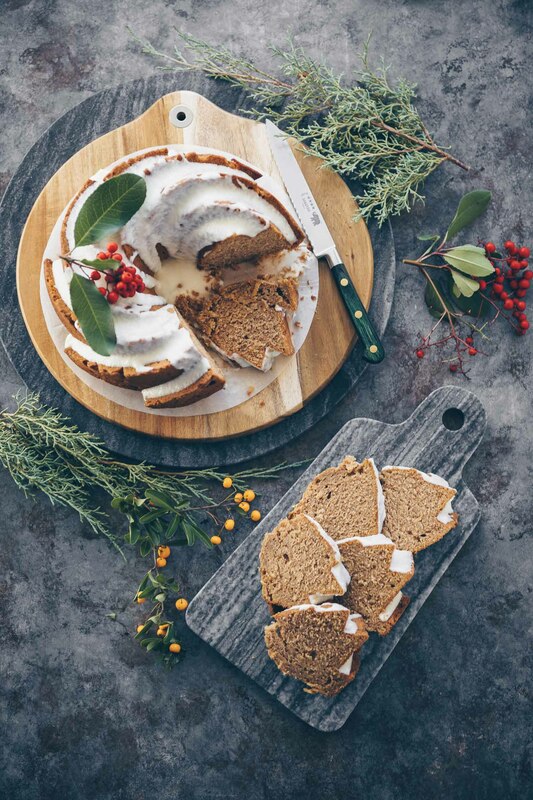 Butter and Flour your Pan: Even if you have a nonstick madeleine pan, butter and flour the molds well so the cakes release easily after baking. Oven Temperature: Make sure your oven is adequately preheated before baking your madeleines. The high temperature will help with the brown bottom, crisp edges and a proper rise. 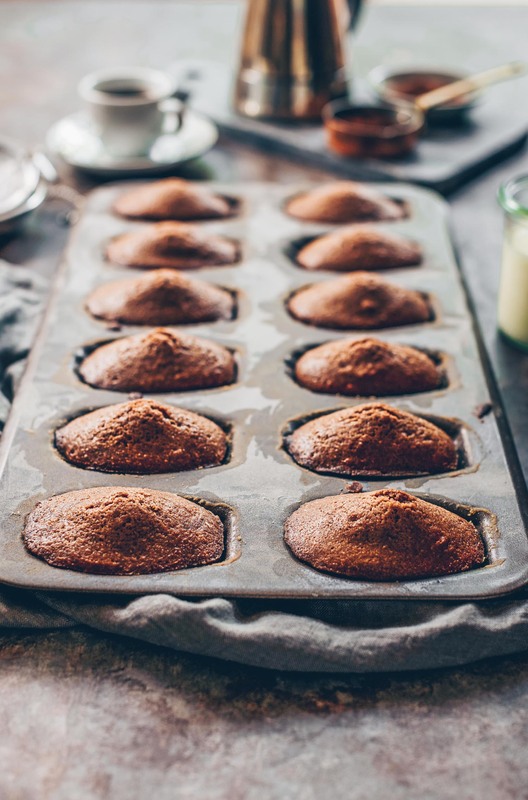 If you follow these baking tips you will be a madeleine expert in no time. 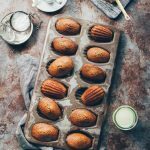 Scroll down to see my other madeleine recipes in the archives. 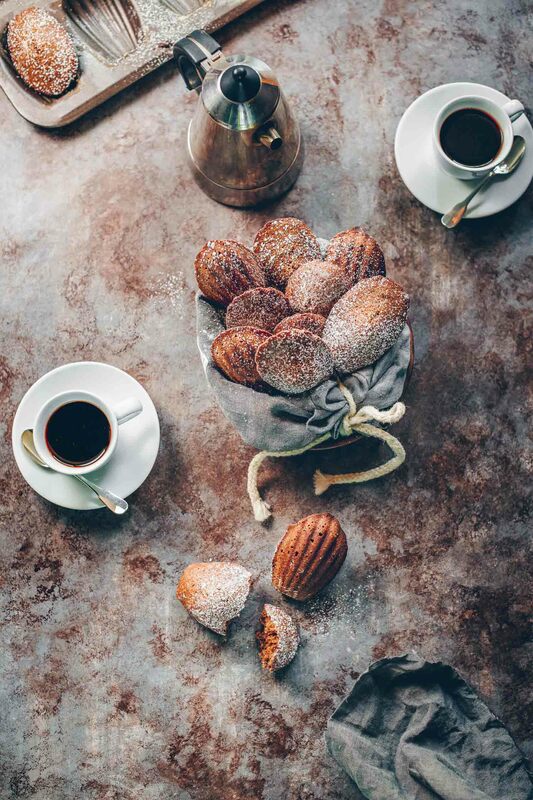 Madeleines are the perfect little cakes to satisfy a sweet craving. These have a lovely vanilla flavor with subtle coffee and chocolate notes. For the signature humps, it's best to chill the batter for three hours up to overnight. Sift together the flour, baking powder, cocoa and salt in a bowl and set aside. Using a hand mixer fitted with the whisk attachment, beat the eggs and sugar together in another bowl on medium speed for two to four minutes or until the mixture is light and fluffy. Beat in the vanilla extract to combine. Using a spatula, gently fold the dry ingredients into the wet mixture. Stir into the melted butter the two tablespoons of coffee before folding into the mixture. *CHILL THE BATTER* Cover the batter with plastic wrap, making sure to press the wrap against the surface of the batter so it creates an airtight seal. Chill the batter for three hours or up to overnight (batter will keep refrigerated for two days) to get the humps. BAKE: Preheat your oven to 400ºF. Butter your madeleine pan and dust with flour (even if it is nonstick), tapping off the excess. Divide the batter among the molds, filling them almost to the top. There's no need to smooth the batter. 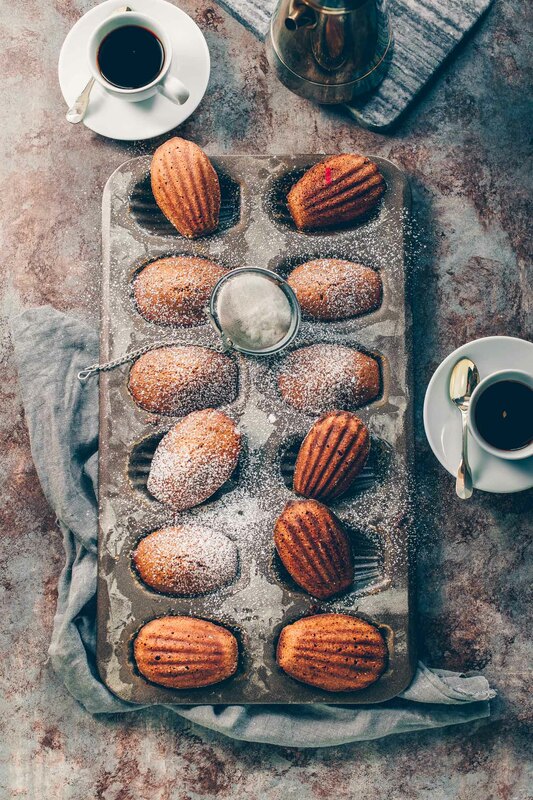 Bake the madeleines for 11-13 minutes or until the cakes are puffed and spring back when touched. Remove the pan from the oven and rap the pan lightly on the counter to release the madeleines.